Orange Bowl Bound Bearcats Finish in Dramatic Fashion in the Night Cap of the 2008 College Football Season! Question of the week: Were you awake to see the Cats score 19 points in 8 minutes and hold off the Rainbows??? The NeumannKy was and there are a few folks that got some "party" calls of excitement after the game that can confirm this. Playing in Hawaii is a total trap for ANY east coast team. There's a reason Hawaii has won 22 of their last 27 at home. The CATS were exhausted and demonstrated a lot of heart pulling off the comeback. We should NEVER go back. Jacob Ramsey should never have another carry as long as "The Human Stampede" is on this team. He is WAY too much of a liability given his butter fingers. Look for Ramsey to get moved to defense next season. Hawaii fans and players are nasty...again, we should NEVER go back. On to the good stuff. THE ORANGE BOWL BABY!!! It's not the Motor City Bowl; it's not the New Orleans Bowl; it's not the International Bowl; it's not the papajohns.com bowl (all of which The NeumannKy attended)....no, no IT'S THE ORANGE BOWL!! New Year's Day....Where are you going to be??? The NeumannKy will be there and be ready to rock! 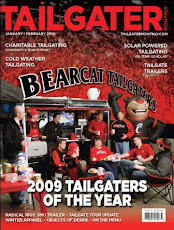 Comment add your comment and let the Bearcat Tailgaters know what your bowl plans are! The NeumannKy and some of the BTC will be at the Hyatt Regency Miami.